It can be for five minutes or five hours. The fact is: No matter who you are or what you do, you deserve an escape. In Chesapeake, you can find it at Elizabeth River Park. On the drive to Elizabeth River Park it&apos;s hard not to wonder if you&apos;ve taken a wrong turn. It is close to the highway and the surprisingly tall, winding Jordan Bridge looms overhead. You might even find yourself doubting your GPS because most other parks in the city are off the beaten path. Elizabeth River Park is not like most other parks. In fact, while other well-known spots in Chesapeake are nature preserves and wildlife refuges, Elizabeth River Park&apos;s central location and otherworldly calmness make it feel like an oasis. The park may only be 12.6 square acres, but don&apos;t let the size fool you. This is a special enclave. A hidden gem. If you&apos;re a fishing enthusiast, you probably already know the 24-hour boat ramp is one of the most popular places to launch in Hampton Roads. There&apos;s also a fishing pier to cast from if that&apos;s your style. A playground is primed for the kids and a dog park gives your pet a change of pace. There&apos;s even a ½ mile trail for you to take a leisurely walk or a quick run on your lunch break. Benches line the waterfront where you can soak in the view, or enjoy a tranquil moment at the variety of shelters, gazebos and pavilions. You can be a local, in town for business, or on a family vacation. 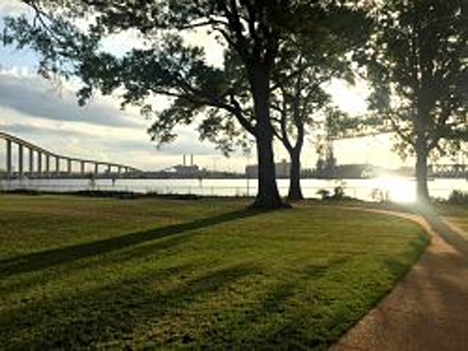 When that urge hits you to step away, even if it&apos;s just for a minute, Elizabeth River Park is the place to be. This is where you can get away while still being near it all.